This type of feeding is used in plants where extremely great precision is not required. The valve can be controlled by an electronic timer or a variable speed motor. 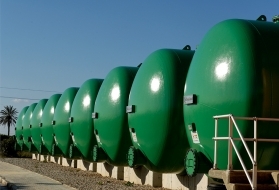 The outputs metered in this way can range from 50 to 1,000 L · h–1. By virtue of being sealed, this unit can also ensure a regular supply to a pneumatic transport system. 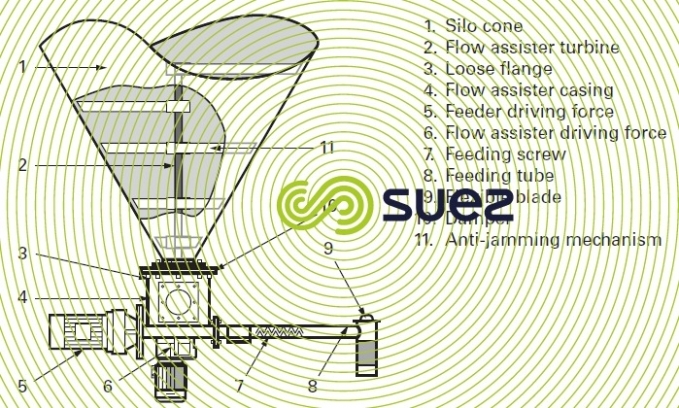 A revolving disk is set into the base of the feed hopper (photo 6). 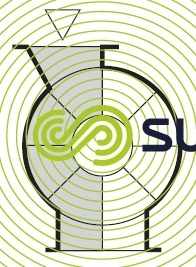 Rotating at a constant speed, the disk has a blade with an adjustable angle of attack and which cuts a more or less large ring through the product. This type of feeder is more accurate than the rotary vane feeder version. It is designed to distribute reagents such as lime, calcium or sodium carbonate, with flow rates of 10 to 1,000 L · h–1. 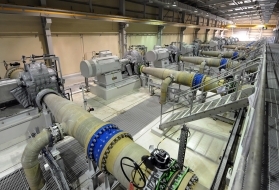 The flow rate is adjusted by altering the blade’s angle of attack since the motor is a constant speed motor, operating either continuously or intermittently. A variable speed motor can also be used. This type of feeder is sufficiently precise for use with most powdered products, including those that are liable to melt. 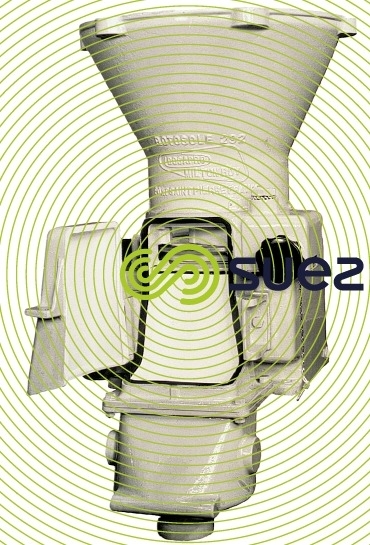 It is fed from a silo equipped with a flow assister (figure 3). This flow assister provides the screw with an even product feed at a constant apparent density. The saturated feed screw draws in a precise amount of product on each rotation of the screw within its casing. The screw and its casing can be either flexible or rigid. Although the best configuration is horizontal, a screw-type feeder will allow the product to be raised up slightly if necessary. The gravimetric feeding will not be affected by variations in the apparent density of the product dispensed. This product is continuously weighed. Any discrepancy between the mass flow rate measured and the mass flow rate set will result in action on the dispensing device in order to cancel out this discrepancy. Figure 4 shows a degremont® gravimetric feeder mechanism controlled by weight loss. 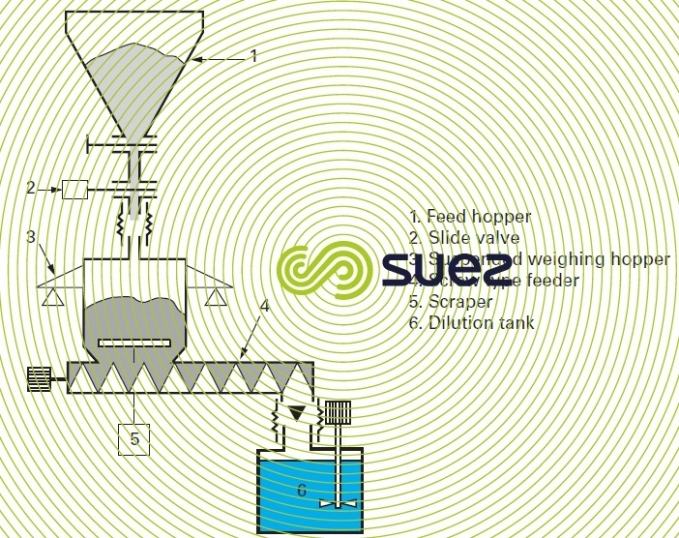 The intermediate feeder hopper containing the product to be dispensed is placed on weighing cells that measure the true mass flow rate dispensed; an adjustment system will alter the screw-type feeder speed in order to cancel out any discrepancy in relation to the mass flow rate set. The weighing hopper is fed from the filler hopper, the penstock opening quickly to full flow until the upper threshold is reached. During the filling period, the adjustment will be locked on to the latest screw speed.